The Australian Packaging Covenant‘s 2013 annual report highlights continued improvement from previous years’ efforts. The Covenant is a co-regulatory* product stewardship scheme based on a collaborative approach between industry, government and community groups to increase recycling and reduce litter. Another increase in the packaging recycling rate, from 39% in 2003 to 64.2% in 2013. Continued reduction in litter based on the National Litter Index. A record number of 925 signatories, with a 95% compliance rate. Improvement across all key performance indicators reported by Covenant signatories. 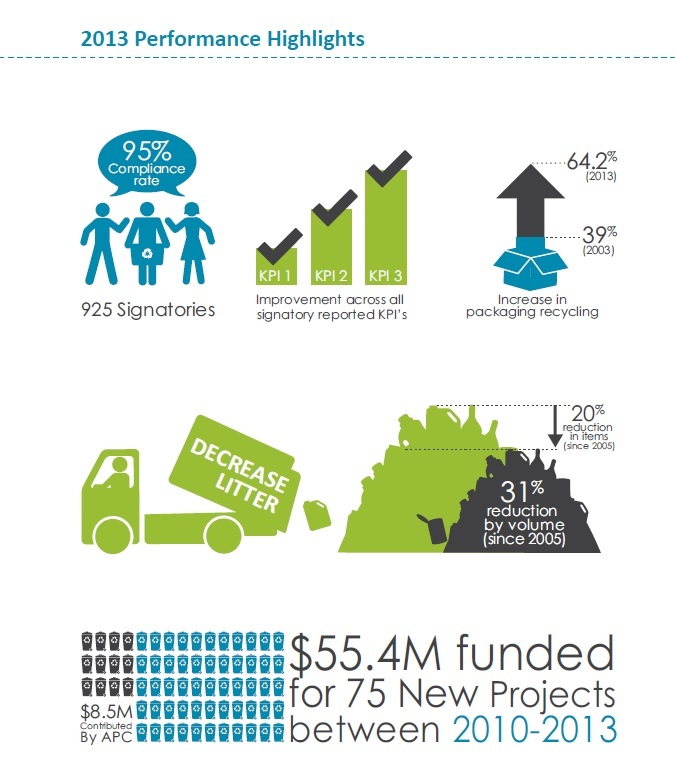 A$55.4M in funding for 75 new recycling and litter related projects under the current term of the Covenant.